CONDITIONS OF SALE: The painting has to be exhibited continuously free of charge until the French elect their first black president. STORY: Any visitor to France today will notice an extremely high level of nationalism and racism. This is of course observable in the media, on the streets, and even in the arts, but nowhere so as in the Paris metro (Metro de Paris). Here the hatred that white Frenchman exhibit of both their coloured countrymen and tourists alike (especially those from English speaking countries) is almost palpable. One cannot but think with nostalgia how French composers of the nineteenth century used Spanish folk songs and themes as inspiration for their classical works, while the rest of Europe was immersed in nationalistic cultural movements. Nationalism is always a sign of weakness, and throughout human history one can observe how a rise of nationalism is followed by a downfall and loss of influence. It is almost like nationalism arises as a social phenomenon after the individuals start sensing that their society is losing its strength, preparing themselves for the survival. For an individual, loving your own nation is as natural as loving your family, but it is stupid to draw the line there. Limiting your love, you limit your potential. 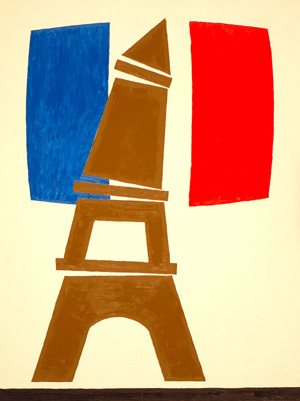 In this painting a deconstructed Eiffel Tower was used as a symbol of French creativity, and the inflated French flag that is destroying the Tower as a symbol of rising nationalism. White background represents the majority white French population, while the black line on the bottom represents immigrants (about nine million) in their humiliating social place. Note that the Tower is not touching the black base, like the white people in the Paris metro try to avoid touching their coloured countryman.